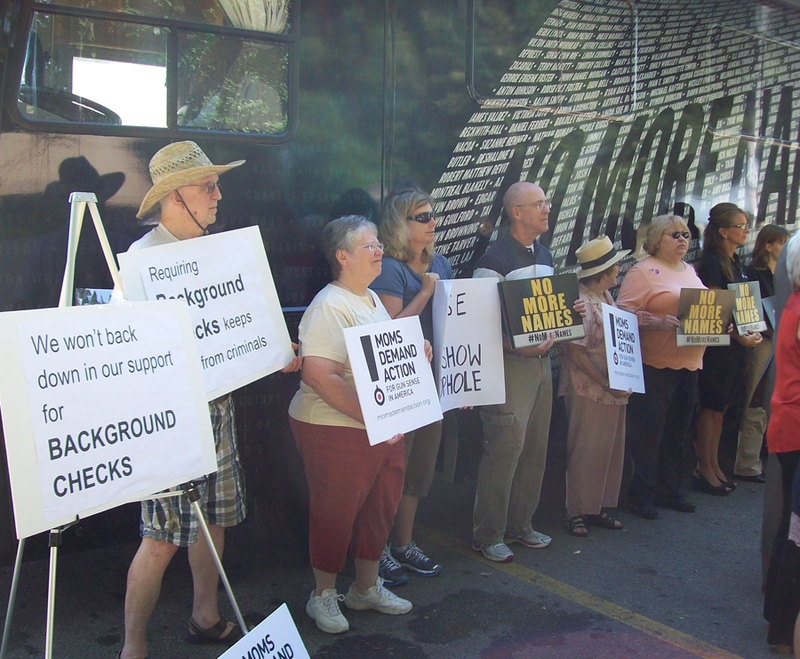 A national bus tour has rolled into Iowa today to urge lawmakers to require background checks for private gun sales. Carlee Soto came to Des Moines for the event. Her sister Victoria was a teacher killed in the mass shooting at a Connecticut elementary school last December. The group’s bus has the number 7738 on it today, representing the number of people who’ve been killed by a gun in the U.S. since the Newton shootings. Pat Maisch, a survivor of the 2011 mass shooting in Tucson, Arizona, came to Des Moines with a message for Senator Chuck Grassley, a Republican who voted against a senate bill calling for comprehensive background checks. “The NRA, the gun lobby and the gun manufacturers are saturated in the blood of innocents and Senator Grassley and a number of our legislators have blood on their hands,” she said. Maisch, who helped disarm the Tucson shooter when he stopped to reload, said when she testified before Grassley’s senate committee 20 months ago, Grassley wasn’t paying attention. “I cannot forget that during that heartfelt, emotional testimony that I was offering about each one of our victims, Senator Charles Grassley apparently found something more interesting on his Blackberry,” Maisch said. Des Moines Mayor Frank Cownie was the emcee for the group’s news conference at a Des Moines park. The names of the more than 7,700 Americans who’ve been killed by a gun since the 20 students were killed at the Newton elementary school are being read aloud in the park. Reading the list will take more than two hours. 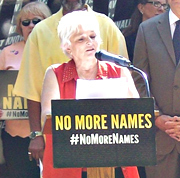 Reverend Cheryl Thomas, the executive director of Iowans for Gun Safety, said a prayer before the reading of the names began. “Each of the 7,738 people who have died since Newtown was loved by someone and had a name,” she said. 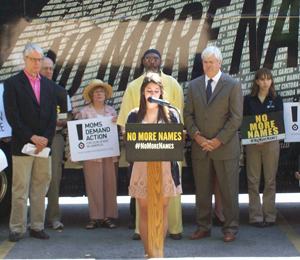 The “No More Names” bus tour is visiting 25 states over 100 days. It’s organized by Mayors Against Illegal Guns, a group led by New York City Mayor Michael Bloomberg. A senator who helped draft the gun control bill that stalled in the senate blames Bloomberg’s aggressive ad campaign for “turning off” senators who otherwise would have supported the bill.